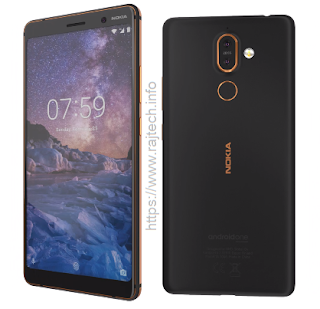 Nokia 7 Plus was launched in February 2018, & it's available on the market in March 2018. 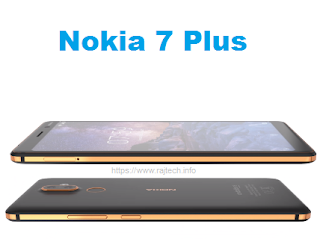 Nokia 7 Plus comes with a 6.00-inch IPS LED capacitive multi-touch screen display with 1080 pixels by 2160 pixels resolution at a 403 PPI density. Nokia 7 Plus smartphone support dual SIM that accepts Nano-SIM for both. Nokia 7 Plus is the bast under Nokia Smartphones. This Nokia mobile powered by Snapdragon 660, Octa-Core (4x2.2 GHz Kryo 260 & 4x1.8 GHz Kryo 260) processor. This Nokia phone comes with 4GB RAM with 64GB internal storage, users can use external storage up to 256GB (micro SD). MicroSD use on the 2nd SIM slot. This Nokia Phone comes with Dual Camara, which is 12MP + 13MP for primary, it has 2x Optical Zoom. The secondary or front camera is 16MP. Available & Released in March 2018. - Li-Po 3800 mAh Non-removable.